The Googlers have spoken. I swear that every.single.day someone searches the interwebs for “light and fluffy egg casserole” and they come across my ‘lil page. I mean, I personally love the recipe, so I don’t blame them. They’ve spoken, and I’m going to answer. It’s time to start sharing some recipes with you more often! And what perfect timing because Red Pack Tomatoes is rounding out American Heart Month will a ‘lil contest between some Pittsburgh bloggers. They are looking for the contestants to share “heart healthy” recipes they’ve developed. Of course I was willing to throw my name into the hat. Not only do I love cooking with Red Pack Tomatoes (canned is always a great option when produce is hard to get/keep fresh in the winter), but I love cooking things that my family will benefit from yet enjoy. February is American Heart Month and Red Pack Tomatoes offers heart healthy choices for delicious creations throughout the year. Essential for good health, Red Pack Tomatoes are 100% natural. A tomato also is very similar to a heart in that it has 4 chambers and is red. Alright, so now on to what you are here for, the yum! Today I am sharing with you an adapted favorite, a good, easy weeknight meal. Enjoy! 2. In a 9×13 baking dish (sprayed with non-stick spray), arrange the 6 bell peppers so they are standing. 3. In a bowl, combine the ground turkey, grated zucchini, rice, and Parmesan cheese until well mixed. 4. In a separate bowl, combine the diced tomatoes, tomato paste and seasonings, then add 1/2 of the mixture to the first bowl. 5. Scoop the meat mixture into the peppers, spreading the love evenly. 6. Drizzle the remaining sauce mixture over the filled peppers and into the bottom of the baking dish. 7. Cover the dish with foil and place into the heated oven. Bake for 35 minutes covered, then an additional 5 with the foil removed. 8. Enjoy carefully, these babies are hot! 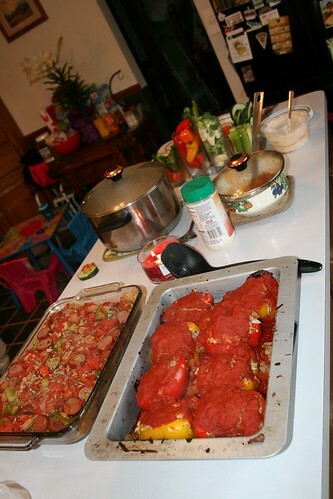 This entry was posted in Dinners, Healthier Choices and tagged recipe, stuffed peppers, tomatoes, zucchini. Bookmark the permalink.